Digital cameras need software to operate, and that software can be updated for improved functionality and performance. This software in your camera is called firmware, and it acts much the same as software on your computer. And please, no arguments about the terms firmware and software… that’s not what this article is about. Updating your camera firmware can improve things like menu navigation, bracketing options, noise reduction, high ISO performance, focusing precision, auto white balance improvements, and more. Updates to firmware can also include proper functionality with new camera accessories such as vertical grips, flash units, and lenses. And, brand new cameras will often have some “bugs” that get resolved through firmware updates (“5D’II black dots” ring any bells?). Every camera has a different way of doing this, but most cameras should have the ability to display the firmware version. Instructions for checking the version can likely be found in your camera manual or through the manufacturer’s support website. Once you know which version you have, check the web for the latest version of the firmware. If the latest version isn’t the same as the version you’re using, it’s time to update. Navigate to the correct page through your manufacturer’s support website, read everything, and follow the instructions to download the firmware. 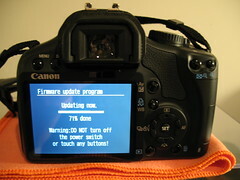 Again, each brand or camera has a different way of actually updating the firmware. Instructions for completing this process can be found on the website you downloaded the firmware. And always update your firmware with a full battery. After the update is complete, run through your menus and check that your settings are correct. You may even have some new settings that weren’t there before. After you check your menus, take a few test shots and make sure the camera is working properly. Here are some of the support websites for the various camera manufacturers. Do note that other websites may be more appropriate for non-US photographers — some camera manufacturers have separate support websites for other countries. DISCLAIMER: I take no responsibility if you mess up your own camera while trying to update the firmware. Do this stuff at your own risk, and read the manufacturer’s instructions VERY CAREFULLY. So how often do you update your firmware? And do you have any other tips for those who haven’t done this yet? This entry was posted in Quick-Tip and tagged Equipment, firmware, photography, software, tips, update on January 13, 2009 by Brian Auer. Great article Brian, your camera is like your computor, they need updated once in a while. Although your computor will do it automatically, your camera won’t, so you must check from time to time for these needed updates. Brian I don’t know if it is just me but I have tendency to never, or very rarely, update my camera’s firmware. As a D80 owner, I found a really odd “bug” where despite having fully charged batteries, a low-battery indicator light would flash and stop me from taking photos. After some research, I found that Nikon had “fixed” this and I had to update the camera firmware. Encouraged by your article I checked the first time for a firmware update for my Nikon D80 and also discovered one. But soon I became pretty fed up with it. Firstly, the Nikon website does not support any downloads usable with my Linux operating system. At the office, I have the possibility to use a PC, but after reading the upgrade instructions, I was really baffled. This because the downloadable files (e.g. the .exe for Windows) seem to be only self-extracting archives containing the two (!) files of the firmware. Even with a direct PC access, I think, it takes longer to download on file and extract it somewhere, than directly downloading two files. Furthermore, you have to trust the issuer of the .exe file, since it may harm your computer and you can’t check it for malicious code before you execute it. The cherry on the cake of course is, that the files have neither a digital signature nor a simple MD5 checksum, which I would expect at least ! To sum up, I am shocked, how complicate, stupid and risky for your computer Nikon makes it for you, to update the firmware and I therefore preferred to continue working with my current firmware version. Well… I’m not familiar with the Nikon process, but it sounds similar to what I’ve experienced with Sony. For my camera, I have to download the self-extracting archive, unzip it, copy the file to my memory card, put the card in the camera, and turn the camera on while holding a certain button or something. I wouldn’t worry too much about the integrity of the exe file if it’s coming straight from a Nikon domain. If the updates in the firmware aren’t worth the hassle, just keep using what you have.